Finally, Global Astronomy Month 215 arrived. Another full month, for the 7th year in a row, to celebrate the wonders of the sky, both at night and day, looking up into the Universe, without any conventional limit. Astronomers Without Borders invented this, preserving the legacy of the International Year of Astronomy 2009 (IYA2009): what an amazing idea! Since the very beginning, Virtual Telescope has been an important contributor to these celebration and this year, for the 2015 edition, new online events are coming. We kicked off GAM2015 with a world premiere event, showing live for the first time ever a mutual event involving two satellites of planet Jupiter. 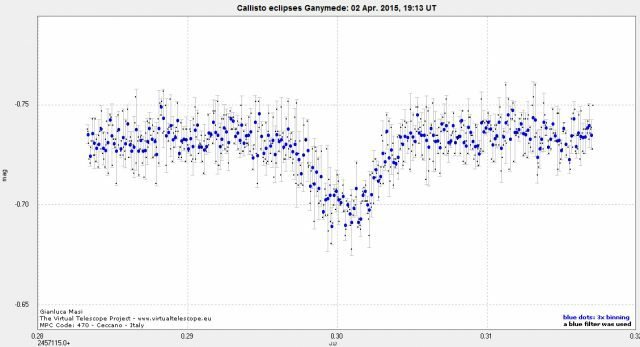 Every six years, around its own equinox, Jupiter offers the geometrical conditions to show its satellites producing reciprocal occultations and eclipses, something truly spectacular. This topic is also amazingly à-la-page this year, as 2015 celebrates the International Year of Light (IYL2015) and Jupiter and its moons played a big role late in the XVII century when scientists started measuring the speed of light. We selected a mutual eclipse involving Callisto and Ganymede, the latter being the largest moon in our Solar System. On 2 April 2015 Callisto partially casted its shadow on Ganymede, generating an almost grazing eclipsing event. At Virtual Telescope we started our live coverage 15 minutes before of the expected start of the event (19h04m4s UT): the Celestron C14 + Paramount ME + SBIG ST8-XME robotic unit captured hundreds of images, each with an integration of 1 second. A blue filter was used to limit the otherwise too much light coming from the observed targets. Each image was used to get a relative brightness estimate of Ganymede (the eclipsed body) against the satellite Europa (visible in the same filed of view of Callisto and Ganymede). Every few minutes, we plotted the resulting curve and shared it with our audience: for a while we saw an horizontal trend, meaning Ganymede was still untouched by the shadow of its neighbour. At the expected time, we started seeing a fading trend, meaning the eclipse started. It was very thrilling to follow how it developed: for almost 16 minutes we saw Ganymede fading a bit, then recovering (the drop in brightness was 0.05 magnitudes, much less that the predicted 0.2 value). Later, the horizontal trend was back again. Above is the plot from the data we collected live, with a few thousands people enjoying it, from dozens of different Countries all around the planet. It has been a truly successful experience, with a topic never shared before in the world in such a way, online and in real time. We did science (these events are vital to improve our knowledge of the dynamic of Jupiter’s satellites) during a very entertaining show, a great combo! Below is the video providing the full podcast of the event. More online cosmic adventures are coming: Happy Global Astronomy Month 2015!